We cannot provide tech support for the general operation of your keyboard; however, we do carry the Mirage manuals. 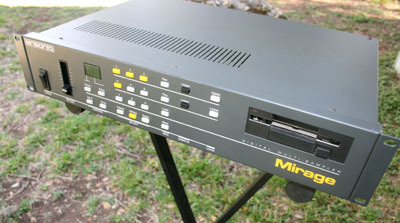 There are four versions of the Mirage sampler, and they all use the same disks and operate in exactly the same manner. As the first two keyboards were both called Mirage DSK-8, we distinguish them by their color. The Black DSK-8 was the original Mirage, built beginning in late 1984, and is easily identified by its black metal case and all black buttons; it says "Mirage" on the top panel. The DSK-8 used a somewhat clunky Pratt-Read keybed assembly, which was improved upon in the next model. Early on in the manufacturing of the DSK-8, the circuitry was revised slightly to decrease the noise floor of the sampler, and this modification was available as an upgrade for owners of the earlier units. The Gray DSK-8 was the second-generation Mirage, still in a metal case, but now sporting a dark gray paint job and a much-improved Fatar keybed. You can easily distinguish these Mirages by the smaller buttons - now gray, yellow, white, and black. Both versions of the DSK-8 sold for $1695, and included two sound disks, a sustain pedal, the Musician's Manual, the Advanced Sampler's Guide, the Formatting Disk, and a laminated Parameter Reference Card. Back panel connections were mono Audio In and Out jacks, a Sync jack, MIDI In and Out/Thru conectors, a Foot Switch jack for the sustain pedal, and an expansion port on the back panel for either an ISF-1 Input Sampling Filter or the SQX-1 Sequencer Expander. The Sync jack on the back panel was intended to sync the Mirage's sequencer to an external clock source; since the sequencer is all but useless, the Sync jack and circuitry were dropped on the later DSK-1. The Mirage DMS-8 was the Mirage rack, first built in 1985, with mono Audio In and Out jacks and the Expansion Port. The rack sampler originally sold for $1395 (later dropped to $1195), and included two sound disks, a sustain pedal, the Musician's Manual, the Advanced Sampler's Guide, the Formatting Disk, and a laminated Parameter Reference Card. 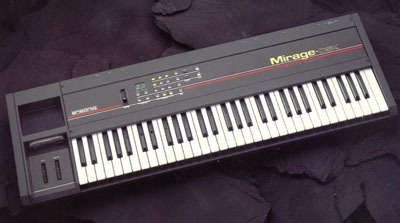 The Mirage DSK-1 was the last Mirage version (1986 through 1988), and sported a gray plastic case with pseudo-stereo outputs. It looks rather similar to the second-generation DSK-8, but you can distinguish the newest Mirage by the red stripe across the front panel, and by the "Mirage-DSK" logo on top (the older logos just read "Mirage"). Gone in the new Mirage were the Expansion Port and the Sync jack. The Mirage DSK-1 sold for $1295, and included two sound disks, a sustain pedal, the Musician's Manual, the Advanced Sampler's Guide, the Formatting Disk, and a laminated Parameter Reference Card. The Ensoniq Mirage boots up from a floppy disk containing the Operating System (O.S. ), which tells the sampler how to work. You need to put a disk which contains the Operating System in the drive, and let the keyboard read it every time you turn the Mirage on - otherwise it will not operate. (The display will flash "nd" - no disk - until a disk is inserted in the drive.) Once you have booted up, the display will show "21", and you can begin loading sounds or sampling. It is always best to use the latest O.S. version, as each subsequent release fixes bugs and often adds new features. The latest O.S. version for the Mirage is 3.2. Every sound disk that Syntaur sells for the Mirage also contains O.S. version 3.2, so you can boot up from any of these disks. You can also use the FMT-2 Formatting Disk to format your own blank disks; this process places the O.S. 3.2 on these disks. nd - No Disk. There is no disk in the drive; if there is indeed a disk in the drive, the floppy drive is not recognizing that a disk is present (i.e. the drive is malfunctioning). Ud - Unformatted Disk. The disk in the drive is not formatted for use in the Mirage. The Mirage has a total of 128k of sample memory, which is split between the two keyboard halves (64k for the Lower sample and 64k for the Upper sample). This allows for a 2-second sample at the 33 kHz sampling rate (or up to a 6.5-second sample at the 10 kHz sampling rate) for each keyboard half. The memory is not expandable. The Mirage will not load sounds from any other samplers; it can only load disks made specifically for the Mirage. The 333-event sequencer in the Mirage is practically useless by today's standards. Though an expander was available to increase note capacity to 1357 events, the sequencer will record only one single track, without any type of editing or quantization, and it cannot sync to external sources.